Have you ever dreamed of soaring above the clouds and flying through the sky? And not just being enclosed in a big metal contraption, but really being able to feel the wind through your face, blowing your hair back, and seeing the majestic view high above everything else, as if you were going to touch the stars. Except for the part where you’ll have the wind blow through your hair, the Center for Process Innovation, a British technology and research firm, has been trying to make leaps and bounds for the future of air travel. 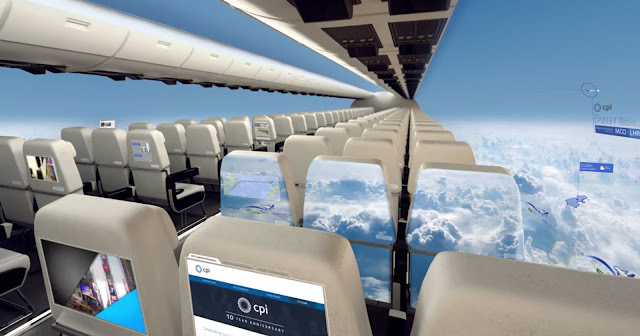 This firm has been researching on the concept called “windowless planes” where you basically do not need to look out through the window to see the clouds, the sun, or the blue sky but the parts of the plan would reflect the view of the outside which would make you feel like you were literally flying in the air. If you remember the Blackbird jet from the X-Men franchise, its invisibility feature allows the passengers inside to be hidden from sight but at the same time to see the world outside. The same could be said for the Avengers Quinjet which also has a cloaking feature. If we were able to make aircraft similar to these, then we would be definitely be moving at lightning speed toward the new horizon. However, at the moment, these ideas are still under the experimentation phase. They are going to make this happen by building the plane with its whole side being made with OLED touch screens. They are not the only ones who are working on this concept though as there are various other companies such as Technicon Design, a UK aerospace firm, and another French design agency which was making renderings for an aircraft that would have a windowless fuselage. The way it works is that there would be cameras installed outside the plane connected to the touch screens which will gather the information and data regarding the view of the outside and it will then project the image to the screens inside the plane. This would give the appearance of being able to soar the blue skies and give passengers a chance to see its beauty. If that were enough to whet your wanderlust appetite, just imagine what it would look like at night when you can see all the stars. Not only do these display screens allow you to get a view of the outside but they double as entertainment systems as well being able to show films and enable a feature for video conferencing. According to Technicon Design, “Removing windows from aircrafts will reduce their weight, thus reducing fuel and maintenance costs and giving designers greater opportunities to enhance and beautify their interiors.” Gareth Davies, chief designer at Technicon, adds that this kind of technology would make it possible for people to see any image that they could ever imagine. At the moment, such a futuristic technology is still out of reach for the ordinary citizen however, with plans for a commercial windowless aircraft, it may be possible within the next decade or so for everyone to venture through the stars. Recently, Emirates Airline has been able to provide this kind of feature to their first class passengers where they would be able to see projected images from the outside through fiber-optic cameras. This would possibly pave the way for a completely windowless plane in the future, which would enable them to be faster and lighter. Nonetheless, the idea is still in the works and there will still be several things that need to be ironed out and tested before launching a completely windowless plane. Safety concerns have been raised and there may be people out there who would not like the virtual environment and much rather look out the window instead to see the outside of the plane. Wherever this idea may take us, I do believe that there is always going to be room for improvement and technology will continue to change and evolve to better our lives, our work, and our experiences.